A fascinating read for the science-fiction buff happily suffering from a debilitating touch of the romantic notion. In The Fox's Honor, Mr. Alford transports an unbending code of chivalry and honor to a futuristic world light years displaced in time and distance from the Avalon in which such Arthurian ethics were born. The romantic will not be disappointed in the love story between Sir Devon Rathenberg, alias "The Fox," and Lady Tamar Falkeep, the woman who has stolen The Fox's heart. Denied any chance of a future due to social station and propriety, Sir Devon and Lady Tamar must conceal their love. But when, in a twisted turn of events, The Lady thwarts Sir Devon's planned death, a new course deciding the fate of the Human Galactic Empire is demanded--a course that will take them and their noble houses into collision with the tyrannical faux Emperor Perod. Neither will the sci-fi buff be disappointed with Mr. Alford's detailed account of escaping the constraints of physical space via null space transportation, meticulous attention to the demands of orbital dynamics, and descriptions of the astro-/aeronautical nuances of intergalactic spacecraft. Those Star Trek afficiandos owning a copy of Hayne's USS Enterprise: Owner's Workshop Manual will demand a similar work from Mr. Alford. I take that back; they won't need one. Mr. Alford, a test pilot himself, renders treatment only an aeronautical engineer's mother could love to the technical aspects of space travel and the vehicles that conquer it. 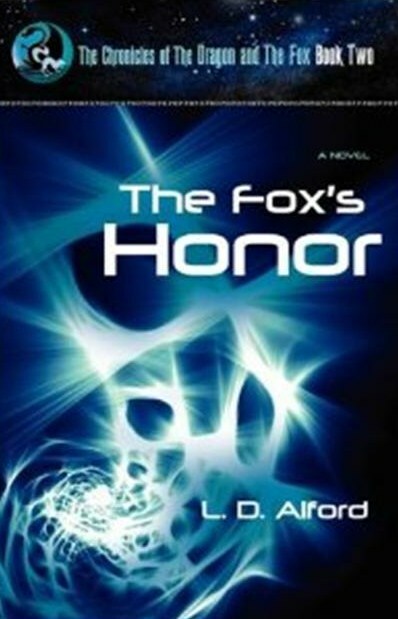 The Fox's Honor is Book Two in The Chronicles of the Dragon and The Fox. It's prequel is The End of Honor, and it's followed by A Season of Honor. I didn't need the prequel to enjoy The Fox's Honor. I am, however, driven to purchase the sequel. I suspect you will be, too.